What a treat! 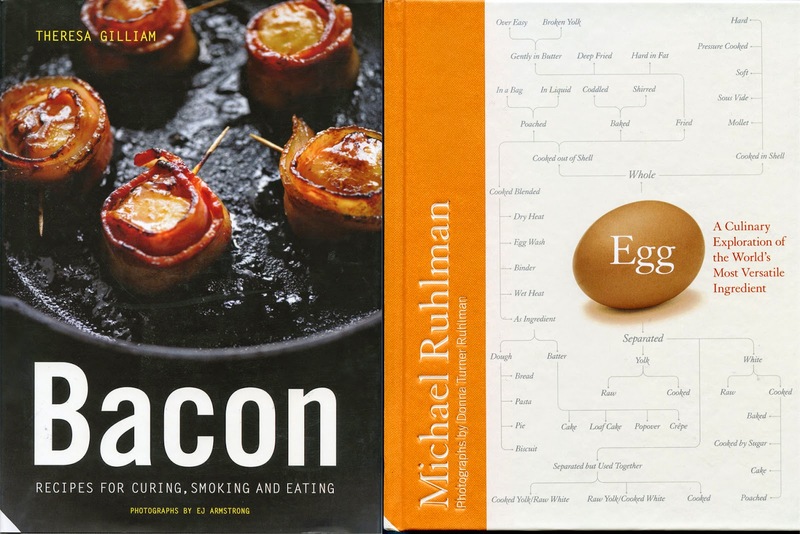 Two books dedicated to two of the most versatile and tasty ingredients, bacon and egg. I have a review and a recipe from each book and a copy of 'Bacon' to giveaway, see bottom of this post for details. Let's start with Bacon by Theresa Gilliam. It's not just another bacon cookbook, the book is described by the author as an ode to bacon and it also covers curing and smoking bacon at home. The recipes are divided by the phases of the day: Dawn, Midday, Dusk and Dark which is rather fun, but before that comes Bacon 101. Learn all about the different types of bacon and different cooking methods and then, if you are really ambitious, you can tackle home curing and smoking bacon yourself. There are also some instructions for a couple of basics, clarified bacon fat and a tender and flaky pastry case made with said bacon fat. And so to lunch and I could happily make and eat a Bacon and Apple Grilled Cheese Panini or a Power Lunch Spinach Salad. There is an amazing Deconstructed BLT which is actually a soup and another BLT variation, the BLT Mac and Cheese. Everything from a classic Pasta alla Carbonara to a Korean-Style Hangover Stew and, oh my goodness, mouthwatering Bacon-Wrapped Beef Tenderlions with Pomegranate Glaze. No bacon book would be complete without a recipe for that wonderful preserve, Bacon and Onion Jam. Ah now to move to the dark side which includes all those recipes that take bacon just a step further than you expect and are ideal for a party. Try a toast with a Bacon Martini while nibbling Bacon Wrapped Stuffed Dates and Bacon Cheese Puffs. For dessert some candied Bacon S'mores, Cardamom Cupcakes with Maple, Bacon and Cream Cheese Frosting and Bacon Baklava. Finish by nibbling on some Bacon, Peanut Butter and Chocolate Chip Cookies. Well it's obviously for bacon-lovers, whether it is the cook or their family who love bacon, there is something in there for every bacon lover. Theresa Gilliam is a food stylist and recipe developer by profession and, along with photographer EJ Armstrong, has created really mouthwatering photographs which show off the food without too much fuss. The recipes are well laid out and range from the very simple with a few ingredients to some more challenging recipes and, most challenging of all the curing of your own bacon. It's obviously not suitable for vegetarians, and is very much a specialist book. There are some really delicious classics and also some inventive recipes using bacon. 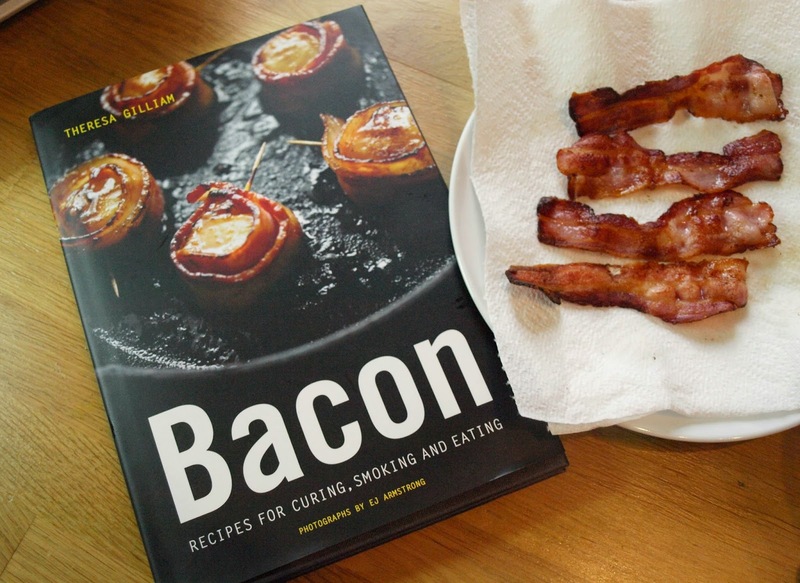 It may find a place on my bookshelf or be a gift to a true bacon lover as I know they would not be disappointed. 1. Preheat the oven to 200C/Gas 7. Line a baking tray with baking parchment. 2. In a large bowl, whisk together the flour, baking powder and salt. Stir in the cheese and bacon until it is evenly distributed and coated with flour. Stir in the cream until the dough is just moistened, about 30 seconds. Do not over mix. 3. Turn the dough out onto a lightly floured surface and gently knead until it is just smooth, about 30 seconds. Pat the dough into a rectangle, 2.5cm thick. Cut the dough with a 7.5cm round cutter into circles, or use a knife to cut into 7.5cm squares. Place the scones on the prepared baking tray, 5cm apart. Bake for 5-18 minutes until golden brown. *Over the top bacon lover's tip: Before putting the scones in the oven, brush with a little melted Clarified Bacon Fat. 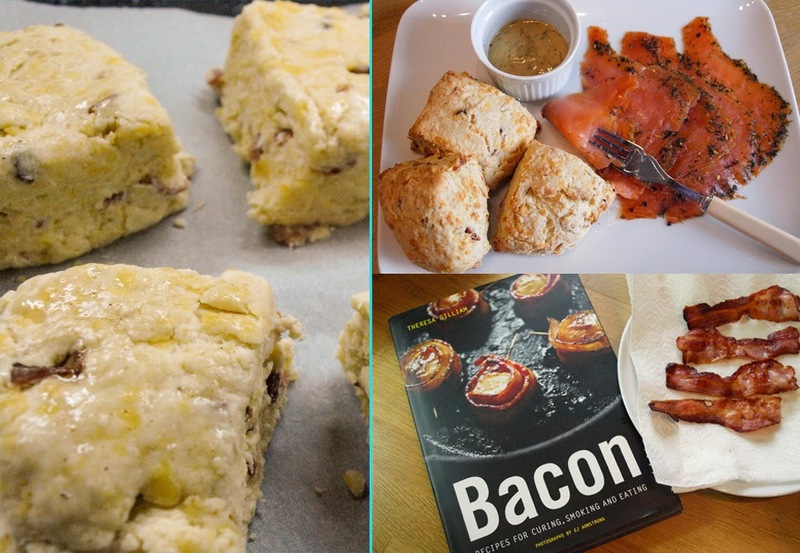 I served the Bacon Cheddar Scones with Gravadlax and dill dressing, they were full of flavour and would be good with soup. Now on to EGG by Michael Ruhlman, A Culinary Exploration of the World's Most Versatile Ingredient. In the introduction Michael Ruhlman tells how US TV personality Alton Brown, described the egg as the 'Rosetta Stone of the kitchen' an ingredient which unlocks the secret language of the kitchen. Well this book has taken the subject of the egg and created a guide to the language of the egg. The Egg Flowchart is a remarkable achievement, the book contains a copy of the flowchart in a pocket on the back page. It's an extended version of what is on the front cover of the book and looks at the egg in all it's forms. It is from this flowchart that the book was mapped out. The whole of the introduction is fascinating and gives a real insight into how Michael Ruhlman thinks, cooks and writes. Who knew you could say so much about a boiled egg! Learn how to make Perfect hard boiled eggs and then use them in Egg Salad Three Ways. The soft boiled egg can have degrees of doneness that can tax the most skilled of cooks, the instructions and advice in this chapter will certainly help to make it easier to get you a soft boiled egg the way you want it. Soft boiled egg recipes include Soft-Boiled Eggs on Artichoke Hears with Creamy Lemon-Shallot Vinaigrette, Pork Ramen with Soft-Boiled Egg and Spring Onions. There are even instructions to cook eggs sous-vide. Includes Weekend Broken-Yolk Fried Egg Sandwich, Quail Eggs Croque Madame, Frisee Salad with Bacon Vinaigrette and Deep Fried Egg, there are coddled eggs, shirred eggs and, of course, eggs poached in water and in sauces. Poached Duck Egg on Duck Confit Hash sounds glorious as does Eggs in Puttanesca Sauce with Angel Hair Pasta. A page and a half is devoted to scrambling eggs so that you can make people swoon! The Omelette also gets a full page and step by step photographs to ensure that nothing is missed. Recipes include Omelette with Creamy Morel mushrooms and Potato, Onion and Cheese Frittata. 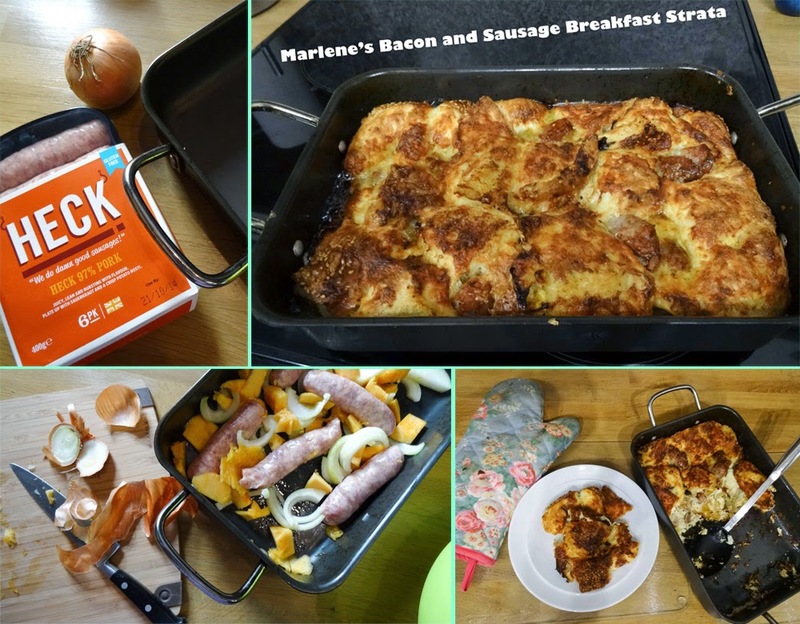 Moving on to Baked egg (dry heat) and we come to the recipe that I recreated: Marlene's Bacon and Sausage Breakfast Strata, a savoury bread pudding (recipe below). Egg wash is also part of blended egg and essential to enable panko breadcrumbs to stick to Breaded Chicken Cutlets with Dijon and Thyme. Egg is explored as a binder for meatballs and as a custard in a Classic French Quiche with Chorizo and Roasted Peppers, Creme Caramel and Bourbon Brioche Bread Pudding. As you see we are moving on from dishes which are dominated by egg to those where egg is more equal in it's position in the recipe such as Challah, Pasta, Italian Drop Biscuits with Lemon Glaze, Gougeres and Profiteroles. Oh and, of course, Cake and the Egg with 'The Keys to Fabulous Cake' and Regina's Lemon Cream Cake looks like a totally Fabulous Cake. All the basics are explained including the notorious 'Creme Pat' and a luscious looking Chocolate glaze which doesn't even include and egg. The cakes just go on and on looking so tempting. Then suddenly we are returned to the savoury with Sweetcorn and Sweet Pepper Fritters with Chipotle-Lime Mayonnaise, Prawn Tempura and back to the sweet with Crepes Suzette. The yolk is Michel Ruhlman's favourite part of the egg and with recipes like Caesar Dressing for Crips Cos Lettuce and Croutons, Blanquette de Veau, Mayonnaise and it's variants and one my favourite foods Pasta Carbonara, it's not surprising that the yolk is given such high status. Then there are those tricky stars of the eggy world Hollandaise and Bernaise. Egg yolks also create dreamy sweets think, Creme Brulee, Vanilla Ice Cream and a Poire William Sabayon. Egg white is like a magic substance acting as a binder, a setting agent, they can clarify stock and be used as a powerful raising agent. Fabulous impressive recipes such as Seafood Roulade with Scallops and Crab which is laid out in step by step photographs, creamy Orange-Ginger Panna Cotta and 'The Amazing Meringue'. I really want to make nougat as it's my husband's favourite sweet treat, this recipe looks relatively simple and again has step by step photos so I might just finally get around to making it. Soft egg white in dishes like Ile Flottante and egg white cake like Angel Food Cake are also featured. Just when you thought there were no more variants on the EGG, there is just one more. This includes Curried Devilled Egg Canapes, Mango-Lime Semifreddo, Chocolate Espresso Kahlua Souffle (yes, please) and Eggnog. I had to think about this quite a lot as this is an unusual book, designed in a very different way from most cookbooks. I would say that this book is for the kind of person who likes to be precise, to understand their ingredients, the science behind the recipe and practice making simple dishes until they 'make you swoon' as Michael Ruhlman would say. Also someone who wants to challenge themselves to make those recipes which can so easily go wrong without attention to detail. In saying that, there are lots of recipes here for everyone and great care has been taken with the instructions so if you follow them, you are most likely to create a good result. There is a lot of information, many recipes and excellent photographs. 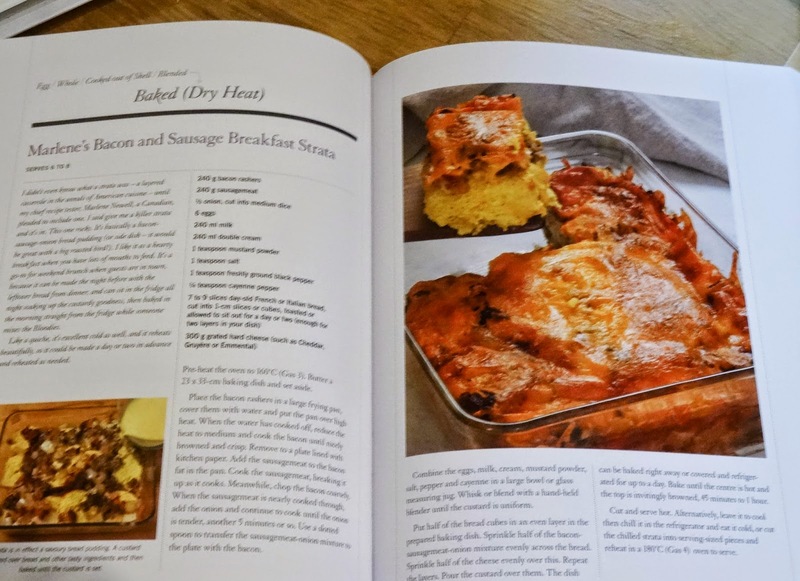 As a cookbook it isn't laid out in the usual way, savoury and sweet recipes are in the same chapter of the book as they are organised by use of the egg, but there are two Indices, a Recipe Index by technique and a General Index. There are some great recipes in the book some of which I have already marked for later. I'm not sure I'm 'geek' enough to work my way through all the text on eggs, I rarely follow a recipe completely and tend to use them as a guide, so those very technical recipes are probably not for me. 300g grated hard cheese (such as Cheddar, Gruyere or Emmental). 1. Pre-heat the oven to 160C (Gas 3). Butter a 23x 33cm baking dish and set aside. 2. Place the bacon rashers in a large frying pan, cover them with water and put he pan over high heat. When the water has cooked off, reduce the heat to medium and cook the bacon until nicely browned and crisp. Remove to a plate lined with kitchen paper. 3. Add the sausage meat to the bacon fat in the pan. Cook the sausage meat, breaking it up as it cooks. Meanwhile, chop the bacon coarsely. 4. When the sausage meat is nearly cooked through, add the onion and continue to cook until the onion is tender, another 5 minutes or so. Use a slotted spoon to transfer the sausage meat/onion mixture to the plate with the bacon. 5. Combine the eggs, milk, cream, mustard powder, salt, pepper and cayenne in a large bowl or glass measuring jug. Whisk or blend with a hand-held blender until the custard is uniform. 6. Put half of the bread cubes in an even layer in the prepared baking dish. Sprinkle half of the bacon-sausage meat-onion mixture evenly across the bread. 7. Sprinkle half of the cheese evenly over this. Repeat the layers. pour the custard over them. 8. The dish can be baked right away or covered and refrigerated for up to a day. Bake until the centre is hot and the tip is invitingly browned, 45 minutes to 1 hour. 9. Cut and serve hot. Alternatively, leave it cool then chill it in the refrigerator and eat it cold, or cut the chilled strata into serving-sized pieces and reheat in a 180C (Gas 4) oven to serve. I have one copy of Bacon by Theresa Gilliam to giveaway, just follow the instructions on the Rafflecopter widget. I like a crispy bacon sandwich with tomato sauce. CRISPY bacon sarnie for me Janice and only my own hen's eggs! I skipped the bacon book and went straight for the egg. It's so hard to imagine life without eggs, especially for all my baking. I really like the way you do your book reviews Janice, clear and to the point. I rather wish I'd adopted something similar for mine. Thanks Choclette, having a structure makes me think really carefully about each book and even if it is not a book that suits me, I can see how it might appeal to others. Glad you were able to scroll past the bacon to enjoy the egg! Has to be smoked for me. My favourite dish is a mix of bacon, potatoes, mushrooms and onions topped with a Camembert, cooked in the oven till it's all melty and delicious yum! the only way i can very crispy otherwise it makes me sick.